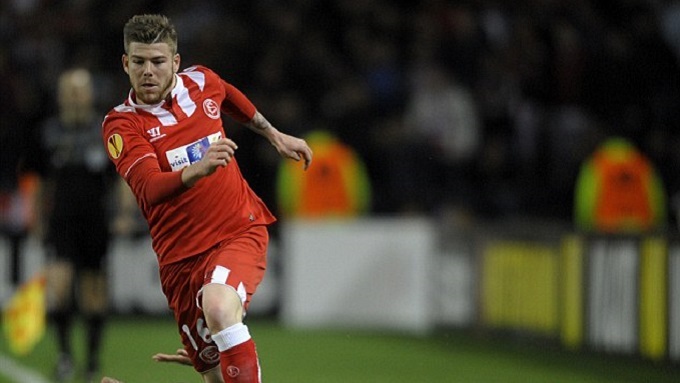 Liverpool have agreed a £12m fee with Sevilla for left-back Alberto Moreno. The 22-year-old Spain international has been withdrawn from tonight’s Uefa Super Cup match and is expected on Merseyside for a medical later in the week. Liverpool chief executive Ian Ayre has spent the day in Cardiff finalising the deal and will be a guest of Sevilla’s at tonight’s game against Real Madrid. Martin Kelly is now expected to leave Anfield to join Crystal Palace. The England international, 24, will have a medical with the Eagles in the next 24 hours after the clubs agreed an initial fee of £1.5m, rising to £2m. Barcelonaâ€™s sporting director Andoni Zubizarreta has not ruled out more signings to follow Thomas Vermaelen as the Catalan club continue their summer of rebuilding. 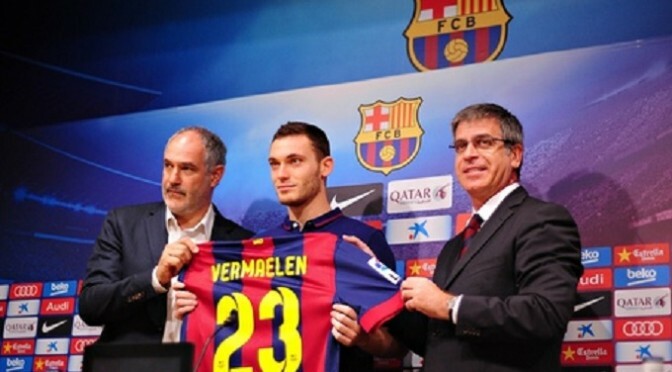 Vermaelen completed his move to Bar§a on Sunday, signing a five-year contract at Camp Nou after joining from Arsenal for a fee that may eventually rise to £15m. The Belgium international and former club aptain at Arsenal joins Luis Su¡rez, Ivan Rakitic, Claudio Bravo, Marc-Andre ter Stegen and J©r©my Mathieu as newcomers at Bar§a, who will be under the guidance of a new coach, Luis Enrique, next season as they look to recover from a hugely disappointing campaign last year under Gerardo Martino. Speaking at Vermaelenâ€™s presentation, Zubizarreta said he is very happy with the talent Bar§a now have at their disposal, but also revealed that the club are still open to more additions if the right players become available. He said: â€œWith the addition of Thomas we completed a defensive line of a very high level. There are options that we are working on for the exit of some players, as such weâ€™re not discarding so that others could come in. â€œWhat I can say is that at midnight on 31 August we hope to have the best squad possible. Even though we are very happy with the players that we have if there is a chance to improve it, we will try. Zubizarreta preferred not to talk about specific targets, who reportedly still include Fiorentinaâ€™s Colombia winger Juan Cuadrado, while he also said Bar§a had not received any offers for their full-back Dani Alves. Vermaelen was not short of suitors as it became increasingly clear his future lay away from Arsenal, with Manchester United one of the clubs heavily linked with his services, but the 28-year-old insisted it was a â€œdreamâ€ for him to move to Camp Nou. Everton’s winless pre-season run continued as a Nolito hat-trick condemned them to a 3-1 defeat against Spanish side Celta Vigo. The Toffees took the lead through an Aiden McGeady strike after 10 minutes. But eight minutes later Nolito converted a deep cross, and he then gave Celta the lead when he robbed John Stones and chipped Tim Howard. And the striker completed his 16-minute hat-trick when he curled a shot past Tim Howard before the break. Liverpool have signed right-back Javier Manquillo on a two-season loan from La Liga champions Atletico Madrid. The Spain Under-20 international is Liverpool’s seventh summer signing. “I’m very happy to have signed for Liverpool,” said Manquillo, 20. Manquillo began his career with Real Madrid before joining their cross-city rivals at the age of 13. He made his senior debut at 17 and played six times last season before suffering a vertebrae injury following an aerial challenge with Real Madrid’s Cristiano Ronaldo in the Copa del Rey semi-final in February. Barcelona midfielder calls time with national team after winning 133 caps and helping Spain win 2010 World Cup and two European Championships. 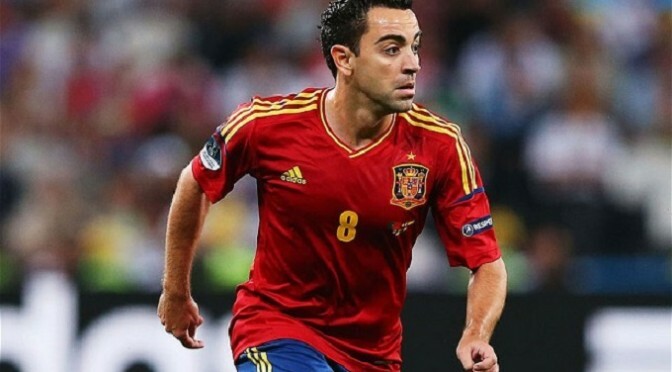 The 34-year-old revealed at a press conference with Barcelona on Tuesday that he has decided to hang up his Spain boots after winning 133 caps and helping La Roja win the 2010 World Cup and back-to-back European Championships. “I’ve taken the decision to leave the national team. My time there has finished,” he said. “From now on I’m another fan of the Spain team.